Some of my best childhood memories are of days on the road, packed into the family station wagon, and Dad getting lost as soon as we crossed state lines. I'd often wonder if we were headed upstate or to another galaxy. And true to form, Dad did not ask for directions. A few extra highway exits and reentries were part of the adventure. Good times were guaranteed once we arrived at our destination - often day trips with an overnight or two passed at a nearby relative's home. Growing up in New Jersey with family up and down the eastern seaboard meant there were a lot of beach and boat outings, camping and hiking in the mountains, backyard picnics, visits to historic sites and theme parks as well as one of Dad's favorite pastimes - the Sunday drive. No destination, no schedule - just driving and taking in the scenery followed by a meal shared together. Often these unplanned meanders were along more familiar routes to relatives, so rest assured, a family-style Italian meal was often the satisfying ending to these adventures. When organizing your family excursion, plan ahead to ensure easy passage and avoid setbacks. They're going to come up, especially if you're inclined to last-minute or impromptu travel. Research reservations and activities for your group, and stick to a budget for meals, fuel, lodging, souvenirs, shopping and any other extras that might arise if you'll be traveling by car. Start making calls at least a month in advance to keep things streamlined and economical for longer trips or those that require reservations for air travel and lodging. Find out when resorts, theme parks and other destinations of interest offer their seasonal specials (many of these are made available for last-minute planners, so always be sure to ask). Also inquire if you can redeem points or get group discounts to theme parks, hotels, restaurants and other venues so you can plan a memorable getaway for everyone. Then start the journey before you set out by including your kids in the planning, especially if they're teens. Assign them tasks: if they love the idea of a cruise, or if your destination was their choice, have them use their computer skills and dig into some of the research with you. In the end, whether you find yourselves lying on a beach, exploring a new city, a historic site, trying an exotic adventure, sailing away on a cruise or checking out a new theme park ride, you'll be creating memories together that will travel on for lifetimes to come. 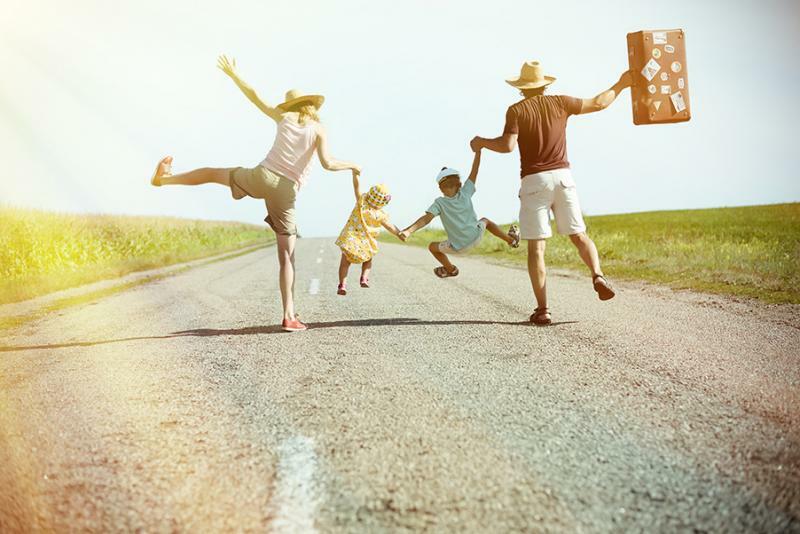 When traveling between destinations, especially in the warmer summer months, reach for lightweight comfortable clothing that can be worn dressed up or dressed down and preferably in natural fibers like cotton and linen. They're breathable and easy to layer for cooler evenings or high-powered air conditioning. Another must-pack travel essential that's finding its way into handbags, backpacks and totes is Aquinelle Toilet Tissue Mist. These lightly scented sprays transform your dry toilet tissue into a refreshing cleansing experience and unlike flushable wipes that can clog your plumbing system, the easy to use spray bottle means a single spray gets the job done, every time. It's discreet, environmentally friendly, hypoallergenic, dermatologist tested and kid safe. Available in six aromatherapy-inspired scents, find your favorite: Ocean Breeze, Citrus Burst, Island Mist, Coco Beach, Rain Forest and Pink Grapefruit. A full size bottle is 8-oz. and the travel version is an easy to handle 3-oz. that's ideal for individual use. There's also a convenient 4-bottle gift set hat makes a unique hostess gift wherever this summer leads you. Machu Picchu, the Galapagos Islands, Costa Rica? Grand Canyon, Grand Tetons and other National Parks? For these kinds of adventures, including VIP access to environmentally protected areas, you'll need to let the experts lead the way. Call a travel agent and research some outdoor tour organizations for special offers, pre-trip packing lists and the best savings on most trips. A cruise is well suited to multi-generational travelers and those with young kids. You get to chose the length of your trip with many large cruise lines like Disney, Carnival, Norwegian and Royal offering 5, 7 or 9-nights on board. Many companies will offer Kids Sail Free promotions or significantly reduced rates for kids aged 12-17. And with so many other families on board, if you do require some grownup downtime, there are plenty of supervised group activities, babysitting and other services that will let you rest easier. It's not just big cities that attract artsy crowds. Many mountain towns across the country are rich resources for the arts and other aesthetic treasures. Many people visit places like Aspen, Colorado for the ski slopes and stay because of the beautiful summers. It's a great destination for clear mountain air, hiking, fishing, mountain biking, arts festivals, farmers markets, galleries and outdoor concerts including the Aspen Music Festival. And when you book early, you can plan to get more than half off typical winter rates. From Maine to Florida, there are dozens of beautiful beaches along the eastern seaboard - each with its own town culture, natural beauty and activities. The farther south you travel, the better the weather and warmer the water will be. But from Delaware to Myrtle Beach and beyond there's plenty of golf, amusement parks, shopping, boardwalks and beachfront resorts for all budgets. Whether you're a history buff or a pop culture junkie, a historical family vacation is an inspiring way to mix education with the thrill of discovering a new place. Many of America's Colonial cities from Gettysburg, PA to Charleston, SC to Richmond, VA and San Antonio, TX are prominent vacation spots with competitive pricing on hotels and accommodations. Book a guided tour, visit museums and battlegrounds, historical homes and architectural marvels or take a ghost tour and explore on your own. And don't miss the incredible reenactments.